In the typical, dynamic Agile environment there are two constants - conditions change and decision need to be made based on these changes. If decision-making authority is too centralized, decisions can be delayed and ill-informed. Conversely, decisions that have a broad impact across teams and business units are often better suited for centralized decision-making. Getting this dynamic wrong can be costly – especially in Agile organizations. For example, requiring centralized authority when decentralized decision-making is appropriate leads to employees waiting for information to be gathered and a decision to be made. Worse yet, a decision that requires local context might be made without accurate information. 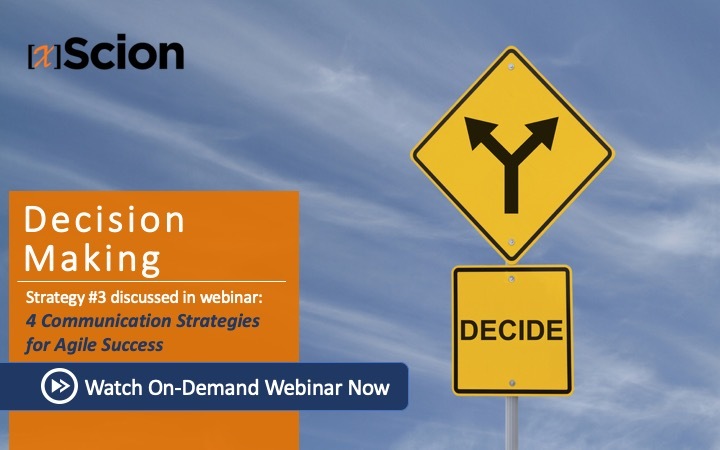 In the on-demand webinar 4 Communication Strategies for Agile Success, Agile expert Bhavani Krishnan introduces a Scaled Agile model that provides a framework for deciding whether decisions should be made at the centralized or decentralized level. The model is general enough to be widely applicable and is a good way to take emotion and other subjective factors out of the picture to make sound, rational decisions. To assess whether decision-making should be centralized or decentralized, the model requires a determination of how frequent and time critical the decision is. It also requires determining if the decision leads to economies of scale, i.e. long-term and broad benefits across the organization. In general, if a type of decision is frequently made and time critical, it is best to be made at a decentralized level. If it is infrequent, not time critical, and involves economies of scale, it is a good fit for centralized decision-making. The Scaled Agile model introduced in the webinar includes a scoring system that balances the criteria when the outcome is less straightforward. When to use decentralized or centralized? Most decisions are frequent, time critical and best made through a decentralized process, which has many benefits. Decentralized decision-making helps deliver value in the shortest sustainable lead time. It also improves overall workplace flow and results in faster feedback. Examples of typical situations best suited for decentralized decision-making include customer emergencies, responses to defects and decisions involving dependencies with other teams. Infrequent decisions that have long-lasting, broad impact and aren’t as time critical are best suited for centralized decision-making. A key element of communication within an organization is a common understanding of the level at which certain decisions are made. Employees empowered to make decisions within a decentralized decision-making process can have a positive impact on product delivery, customer satisfaction and employee engagement. Watch the webinar (available on demand here) to learn more about the Scaled Agile model and for detailed examples illustrating how to use it. It provides a great framework for thinking about how to create an effective decision-making environment within your organization.